On the island of Hawaii, the remote rainforest Wao Kele on the slopes of Kilauea is the home of the volcano goddess Pele and her ʻohana (family) of deities, an ancient hunting ground that continues to be a place of ceremony for Native Hawaiians today. 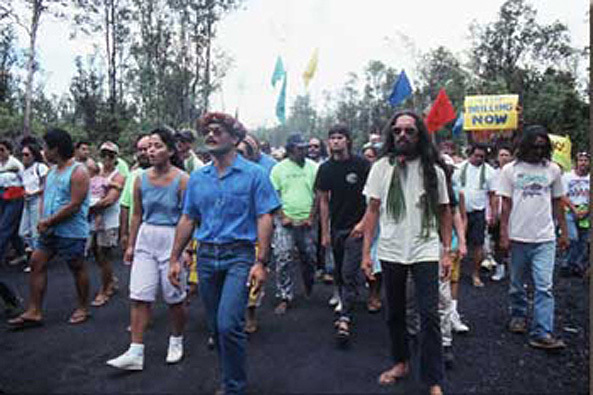 When geothermal development in the forest was proposed in the 1980s, Native Hawaiians raised a battle cry and rose to the challenge of a protracted but ultimately successful struggle to preserve the forest in perpetuity. “We took a stand for this land two decades ago in the courts, and have never given up the fight to find a permanent way to protect this forest,” said Palikapu Dedman, President of the Pele Defense Fund, the native organization that led the fight to protect Wao Kele. The southeastern district of Puna (meaning “wellspring”) on the Big Island is considered by Native Hawaiians to be the most sacred area of the island chain, the place where the sun first touches the islands each day and where rainclouds first break across the land. It is where Kane, the god of freshwater, and Pele, the goddess of life force (embodied in the fire, steam and heat of volcanoes) meet. It is also the birthplace of hula. Hawaiians settled the area sometime before the year 600, drawn to the freshwater springs near the ocean shore, but the area’s tremendous volcanic activity and fears of Pele’s volatile temper limited the population. Native Hawaiians continue to use the forest for religious and subsistence purposes. Wao Kele O Puna is the largest tract of lowland tropical rainforest in the U.S. and a treasure of native biodiversity, home to numerous primary and rare plant species including häpuʻu ferns, ʻieʻie vines and köpiko, many of which help to keep down the population of invasive species in the islands. Hawaiian bats, hawks and ʻamakihi honeycreepers are among the winged inhabitants. There are thought to be many more as-yet-undocumented species within the forest, an amazing situation for a forest only twenty miles south of the city of Hilo. As the entire portion of eastern Hawaii island is a volcanic area, lava flows occasionally cover areas of forested land. Thus, while some forests are covered with lava, other forested areas must be healthy so that growth can spread back to the damaged areas. Wao Kele has acted as this kind of “seed bank” for the Hawaii Volcanoes National Park just south of it. Wao Kele also covers 20 percent of the Pahoa aquifer, which provides most of the drinking water to the residents of the island, so the health of the forest is directly related to the ability of people to continue to live on the island. When the Kingdom of Hawaii was overthrown in 1893, Hawaii became a territory of the United States. Lands that had been traditionally held by the monarchy in trust for the Hawaiian people (”Crown Lands”) were “ceded” to the U.S. government. In subsequent years, the federal government leased or sold much of the 1.8 million acres of former Crown Land to private landowners. Wao Kele O Puna was thus “ceded” in 1898 to the U.S., which in turn passed it on to the State of Hawaii upon its creation in 1959. However, Kahauale’a, the pristine tract of forest land adjacent to Wao Kele was privately owned, as it had been purchased in 1892 by James Campbell, a Scottish carpenter, at public auction. In the 1980s the State of Hawaii became embroiled in a controversy over plans for a geothermal power plant and numerous wells being developed by Puna Geothermal Ventures and the James Campbell Estate. The state traded Wao Kele for Kahaualeʻa, the adjacent private land owned by the Campbell Estate to allow the development to proceed on Wao Kele. At the time, the state claimed that the geothermal development couldn’t move forward due volcanic activity on Kahauale’a, thus the state would have lost the economic benefits of the development. Some activists in favor of the swap argued that Kahaualeʻa was more environmentally important than Wao Kele so that the trade was beneficial to the state. But for Native Hawaiians the geothermal plans and land swap stirred up fears that a privately owned section of Wao Kele O Puna would be desecrated and the fragile environment forever destroyed. Further, the Pele Defense Fund and the other organizations that joined the fight asserted that the forest held innumerable burial and archaeological sites. In the 1980s the State of Hawaii became embroiled in a controversy over plans for a geothermal power plant and numerous wells being developed by Puna Geothermal Ventures and the James Campbell Estate. The state traded Wao Kele for Kahaualeʻa, the adjacent private land owned by the Campbell Estate to allow the development to proceed on Wao Kele. At the time, the state claimed that the geothermal development couldn’t move forward due volcanic activity on Kahaualeʻa, thus the state would have lost the economic benefits of the development. Some activists in favor of the swap argued that Kahaualeʻa was more environmentally important than Wao Kele so that the trade was beneficial to the state. But for Native Hawaiians the geothermal plans and land swap stirred up fears that a privately-owned section of Wao Kele O Puna would be desecrated and the fragile environment forever destroyed. Further, the Pele Defense Fund and the other organizations that joined the fight asserted that the forest held innumerable burial and archaeological sites. A civil disobedience campaign was launched by the Pele Defense Fund, an offshoot organization of Protect Kahoʻolawe Ohana (see Kaho`olawe Island site report), contending that the geothermal energy well sites and power plant would be an insult to Pele and drastically diminish her mana (life force). When test holes were drilled in Wao Kele in 1988, massive sit-ins were conducted, drawing media attention and further entrenching both sides. The geothermal company put up a fence topped with barbed wire around the test areas and launched a media campaign labeling protesters as outside agitators, despite the significant leadership of Native Hawaiians. A major action in March 1990 brought 1,500 protesters to the forest and led to the arrest of 141 people. The Pele Defense Fund also filed suit against the state, and took the case all the way to the Hawaii State Supreme Court. The case was unsuccessful and failed to halt the land swap. However, the Court handed down a controversial ruling allowing Native Hawaiians expanded rights to access private and undeveloped public lands for hunting and spiritual purposes. This set a precedent for many later battles for sacred site access in the Hawaiian Islands. Many years of litigation led to years of negotiation between the Pele Defense Fund, the U.S. Forest Service, the Campbell Estate and the Office of Hawaiian Affairs (OHA). In 1994, the geothermal project was abandoned. When the Campbell Estate decided to put the land up for sale in 2001, both Hawaiian Senators Daniel Inouye and Daniel Akaka got involved, pressuring the Forest Service to commit $3.35 million from its Legacy Program—a program intended to protect forests of cultural significance—toward the purchase of nearly 26,000 acres of Wao Kele O Puna. Eventually, the Trust for Public Land, under their Tribal and Native Lands Program, paid the remainder of the $3.65 million asking price and signed the sacred forest over to OHA, a state agency responsible for managing Native Hawaiian lands in trust. OHA will manage the land for ten years in conjunction with Hawaii’s State Department of Land and Natural Resources. Wao Kele O Puna is the first of the former Crown Lands to return to Native Hawaiian control. Faulstich, Paul. “Hawaii’s Rainforest Crunch: Land, People, and Geothermal Development.” Cultural Survival Quarterly, Issue 14.4, October 31, 1990. McGregor, Davianna. Na Kua’aina: Living Hawaiian Culture. University of Hawaii Press, 2007. Public Information Office. “Protection of Wao Kele O Puna Celebrated.” Office of Hawaiian Affairs, August 27, 2007. Ruel, Tim. “Campell Estate selling half its holdings.” Honolulu Star-Bulletin, April 13, 2001. Tribal and Native Lands Gallery, Land & People, Trust for Public Lands, Vol.29, No. 2, Fall 2007.